Also referred to by the alternative common names Coral-wort and Coralroot Bittercress, Cardomine bulbifera used to be recorded under the synonymous scientific name Dentaria bulbifera. This rare (in Britain and Ireland) perennial herb is a member of the family brassicaceae. Growing to a height: of 30 to 60 cm with unbranched almost hairless stems, Coralroot produces dark-brown or purplish bulbils in its upper leaf axils. The flowers are 2-3cm across and have four pale pink to mauve or purplish petals and four sepals. Flowers are borne in compact inflorescences that are initially almost umbellate. The slightly toothed stalked leaves are alternate, the lower ones being pinnate with two or three pairs of leaflets while the upper lanceolate leaves are usually entire. A rare find in Britain and Ireland, where the majority of known sites are in the south, Coralroot is more common in some parts of mainland Europe, from Finland down to central France and eastwards to the Balkans, western Asia and the Caucasus. 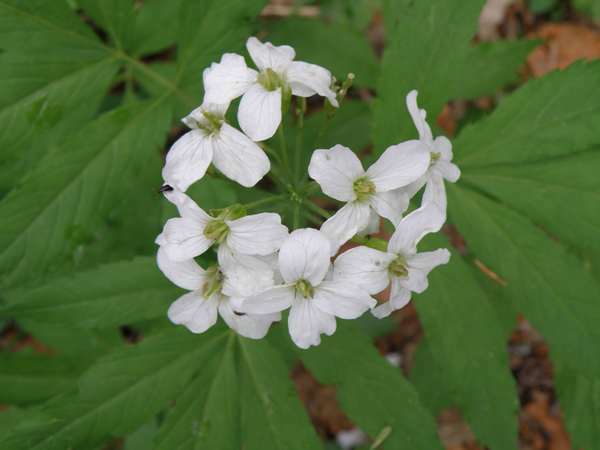 Cardamine bulbifera grows in calcareous woods, particularly where there is Hazel.. Propagation is possible via the bulbils, which fall to the ground and take root in the decaying leaf litter; however, the plant also spreads vegetatively via its rapidly-spreading rootstock. In northern and central Europe this wildflower usually blooms in April, May and June. A few stragglers in shady places sometimes last into early July. Cardamine, the genus name, comes from the Greek noun kárdamon, an expensive spice plant originating from India, Pakistan and Nepal, although nowadays most of the world's cardamom spice is grown and processed in Guatemala. 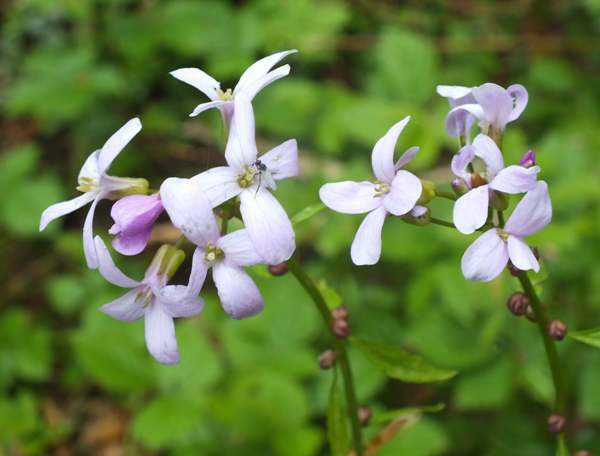 There is no close botanical relationship between the various cardamon plants and Cardamine species, so the reason for this choice of genus name is obscure. The specific epithet bulbifera means 'bearing bulbils', and it refers to the brown bulbils that form in leaf axils on the stems - see picture at top of this page. Although definitely not a substitute for the spice cardamom, Cardamine bulbifera leaves and roots are reported to be edible and to have a hot cress-like taste. 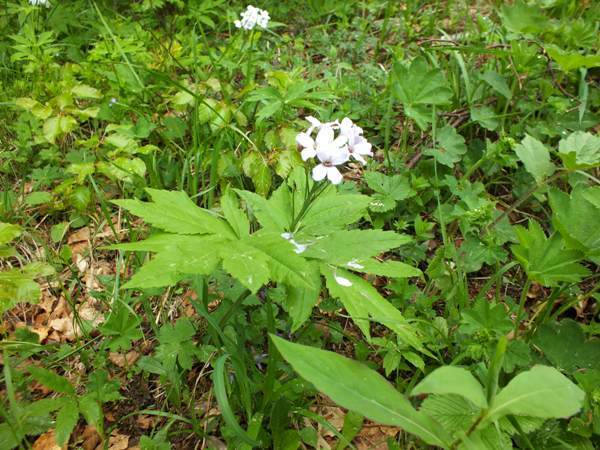 The pictures of Coralroot shown on this page were taken in France in late May and early June.